Address: Rm180,27/F Ho King Comm, CTR 2-16,Fayuen ST, Mongkok Kln, Hong Kong. 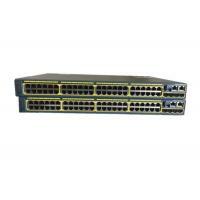 Cisco Catalyst 2960-S Series Switches WS-C2960S-48TS-L is a model, designed for enterprise, midmarket, and branch office networks equally. It has 48 RJ-45 10/100/1000Base-T Network LAN ports and provides LAN Lite feature set. The Cisco Catalyst 2960S Series Switches are the leading layer 2 edge, providing improved ease of use, highly secure business operations, improved sustainability, and a borderless network experience. The Cisco Catalyst 2960S Series Switches include Cisco FlexStack switch stacking capability with 1 and 10 Gigabit connectivity. Table 2 show the details of WS-C2960S-48TS-L.
Show the appearance of WS-C2960S-48TS-L.
1.100% Cisco original factory sealed clean serial. 1. Fast: in 2-3 days upon receipt of payment. 3. Economic: Low cost express fee via DHL, Fedex, TNT,EMS,Postal etc.